Children generally model their parent's behaviours including those related to managing stress. Parents who deal with stress in unhealthy ways risk passing those behaviours on to their children. On the other hand, parents who deal with stress in healthy ways promote better adjustment and happiness for themselves. By taking small, manageable steps to a less stressful life, families can work towards meeting their goals to be psychologically and physically fit. Take time to evaluate your lifestyle: It is important to model healthy behaviours and good stress management techniques for your children as they are more likely to lead a healthy lifestyle and are less likely to associate stress with unhealthy behaviours. Talk about it: If you find your child being stressed, make it a point to ask him or her about their worries. Having regular conversations can help a family understand and address any stressors that your child or another family member may be experiencing. Low levels of parental communication have been associated with poor decision making among children and teens. Promote open communication as it is just as important as eating well and getting enough sleep and exercise. Create a healthy environment: Your home, workspace as well as social environment can influence one's behaviour. Hence, it is important to alter the environment to alleviate stress. Clearing up clutter is something that you and your children can control as it teaches them to focus on those things they can control when they're feeling stressed. Target one habit at a time: It's common for a parent to aspire that the family makes multiple important changes such as eating healthier, being physically active, getting ample amount of sleep or spending more time together. Changing behaviours usually takes time. Start with changing one behaviour at a time; you and your family are more likely to experience success which can thus encourage your family to tackle other challenges and to continue making other healthy changes. Focus on yourself: When you or your family are experiencing stress, make a conscious effort to take care of yourselves. When you feel overwhelmed, people often fall into cycles such as eating fast food or plugging into sedentary electronic activities like watching TV and sleeping less. Research has shown that children who are sleep deprived are more likely to have behavioural problems and parents have a big influence on their food choices. 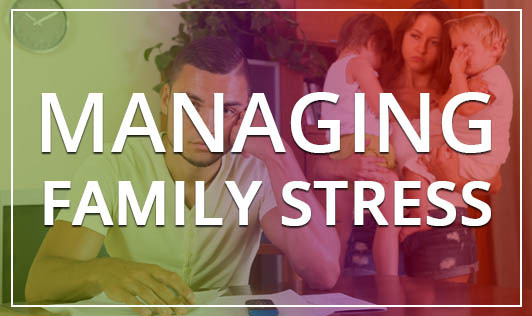 A healthy family dinner followed by a family activity such as walking or playing a board game, topped off with a good night's sleep can do a lot to lessen the negative effects of stress. If you or a family member is struggling with changing unhealthy behaviours or is unable to manage stress, consider seeking help from a health professional!